New software from Feeling Software provides a 3D view of a large area under video surveillance--such as a campus. Initially targeted for city surveillance, the application, called Omnipresence, helps a public safety person quickly understand a situation as viewed through multiple video cameras. "The issue is that simple tasks, like following a suspect from one camera to another, become incredibly complex in a system with many cameras," said Joshua Koopferstock, director of marketing for the company. "If the suspect walks off the left edge of the frame in camera #33, which of the other 50 cameras do you look at to continue to watch that person? Where is camera #33 in relation to camera #12? Omnipresence solves problems like these and makes the surveillance system truly scalable." Feeling integrates with video management systems from Pelco, Genetec, and Milestone Systems to receive live and archived video feeds. These videos are projected inside of a 3D map of the facility in their real locations. The company creates a 3D map of the facility or area being secured from floor plans and maps, and each camera's position is precisely located inside of the 3D map. Then via the video management system, an Omnipresence server receives live and archived video content from multiple cameras and optimizes it for 3D projection. 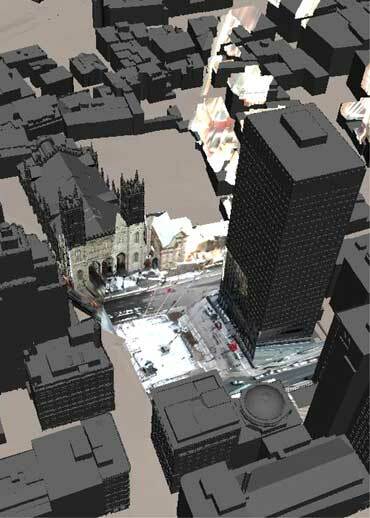 Omnipresence takes the content (live or archived video) received from the VMS and projects the corresponding video through each of the cameras inside the 3D map, as though it were a video projector. This provides context so that the operator knows where a video feed is in relation to the others around it, what areas of a facility have coverage, and which areas are blind. "City-wide and large-scale surveillance is one of the biggest areas of interest in security today," said Christian Laforte, president of Feeling Software. "We saw a way to apply our expertise in 3D graphics to solve real problems that security experts are facing as they try to scale up their systems."